It was another tough game for UCF offensively, as the Knights fell to the No. 12 Cincinnati Bearcats 49-38 Tuesday night at the CFE Arena. 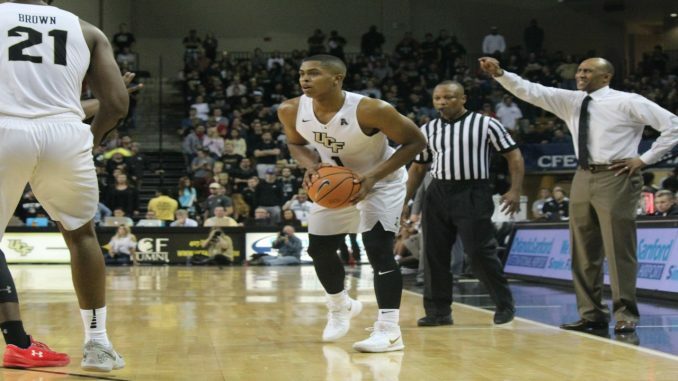 The Knights, who came into the game averaging the third fewest point in the AAC, got a boost for this game in point guard B.J. Taylor returning from injury for this game. “Him being back on the floor definitely will, as he continues to get himself in shape and get his timing back will definitely make it easier offensively for the guys out there on the floor, because you have someone that’s a proven scorer,” said coach Johnny Dawkins. This game promised to be a defensive battle, with the Bearcats (16-2, 5-0 AAC) and Knights (12-6, 3-3 AAC) coming into the game ranked first and second in the AAC in points allowed and opponent field goal percentage, respectively. That is exactly what transpired, as both teams had their lowest offensive output of the season. Taylor, who was on minutes restriction after having missed 16 games, started the game on the bench, as both teams struggled to find their offensive rhythm early in the game. There was just 10 points scored between the two teams through the first five minutes of the game. After the first media timeout, Taylor came onto the floor for the first time since the season opener. His impact was felt almost immediately, as the Knights would go on an 8-1 run to take a 14-5 lead with just under nine minutes to go in the half. UCF’s offense would stall for the remainder of the game, in part due to some untimely fast break turnovers and misses at the rim, but mainly because they were trying to figure out their new two-point guard lineup. Cincinnati was able to hit a couple threes to bring the game to 19-15 with the Knights leading at half time. Both teams shot under 25 percent in the first half. Cincinnati came out of halftime and really stepped up the pressure on its full court press, which resulted in the first few UCF offensive possessions of the half ending in a shot clock violation or a tough shot at the shot clock buzzer. This set the tone for the rest of the game, and allowed the Bearcats to take their first lead of the game three minutes into the first half. The Knights were able to tie it back up at 30-30 with just under 13 minutes left in the game. The series of events that followed, including a missed two-on-one fast break chance for the Knights that turned into a Cincinnati three pointer, and a seemingly frustration intentional foul by redshirt freshman Ceasar DeJesus, gave the Bearcats the lead back and the momentum, and the Knights were never able to recover. Junior center Tacko Fall scored on three straight possessions late in the second half, but it was not enough to overcome the 19-8 run Cincinnati ended the game on. Despite Taylor being back, the Knights struggled again on offense, as they were trying to readjust to Taylor being on the floor. UCF finished the game shooting 30 percent, having 14 turnovers, including 9 in the second half. Fall and Terrell Allen led the Knights with seven points each. Taylor finished the game with six points, all in the first half, only taking two shots in the second half. UCF will go to USF for its next game on Saturday.